It’s been almost four months since we first met our fourth child in a crowded government building in China. The months since then have been very challenging, stretching, and a time of growth for our whole family. We’ve all had to adapt to each other and learn how to be compassionate and loving, even when it’s hard. Sawyer is an amazing kid. He has surprised us with his resiliency and ability to adapt to his new surroundings. He is extremely perceptive and, although he says only a few words, he can communicate really well. One of the ways that we can tell he is getting more comfortable with us is that he is getting more picky with his food. He used to eat anything we gave him and would constantly beg for more. Now, he is more choosy and doesn’t ask for food all the time. He is trusting us that we will give him food when he needs more, and he doesn’t have anxiety that the food will run out. We’ve been taking him out a bit more, and he’s been to church a few times now. He is very social and loves being with people, so he really enjoys those times. Violet had the most trouble warming up to Sawyer when he first came home, but in the past month, they have formed an amazing bond. It really is incredible the difference between them. They were very competitive for my attention, but now they play together really well, and Violet loves to mother him and find things for him to play with. Their relationship has been such a joy to watch blossom. 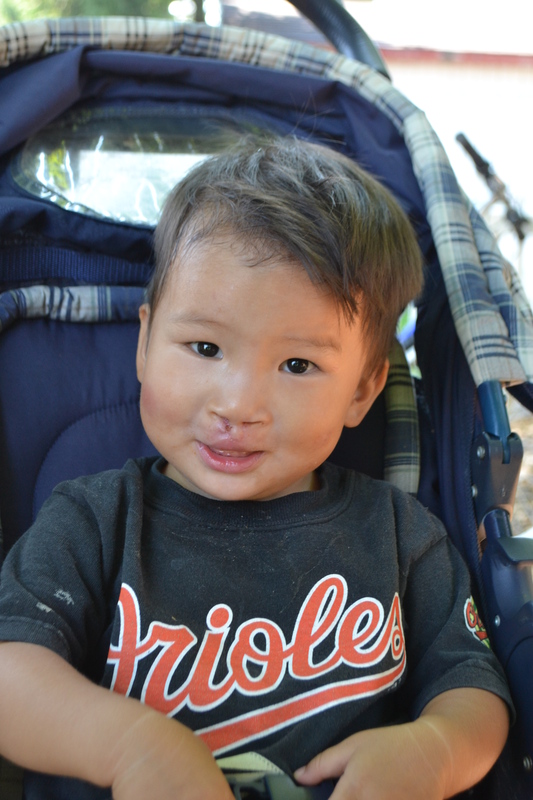 His cleft lip surgery was seven weeks ago, and his mouth has had a lot of trouble healing from it. He developed an infection above his lip, and it took quite a long time for it to finally start healing last week. Because of it, he has a scar at the incision site, but at his next surgery in a few months, the surgeon should be able to repair the scar. 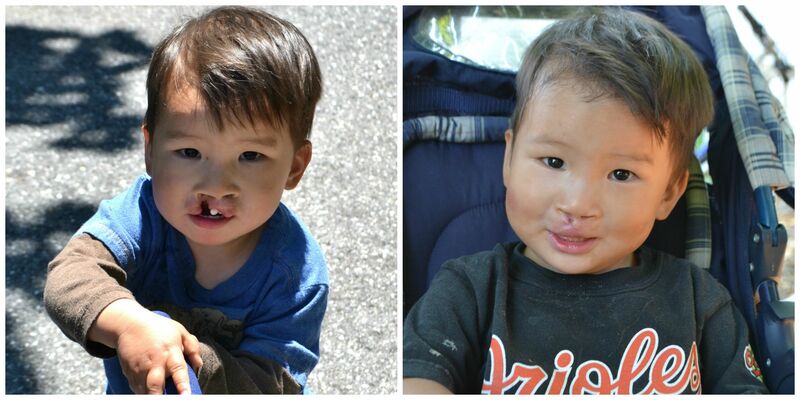 Here is a before/after from the surgery: He is in a lot of ways a typical two year old. He demands a lot of my attention and can be quite exhausting. But he is starting to play independently and with the other kids really well, and it is getting easier. There are many moments of frustration but also many moments of joy and amazement at the blessing he is to us. It’s amazing how, as time goes on, he is starting to blend right in with our family, and it’s getting harder to remember the time when he wasn’t here with us. He has taught me how to be patient, to love even when I don’t feel like loving, and to have more compassion and empathy for people. It’s forced me to slow down and pay more attention to the small things. He thrives on eye contact, especially when he is upset, and he calms down and feels so much more settled when I hold him and he can stare into my eyes. To be able to comfort him feels like such an honor and a privilege. The fact that he trusts us enough to do that is a gift and makes me weepy to think about. He has had such a hard life at a very young age, and yet he still lives with joy and confidence in us as his parents. It spurs me on to be a better mom. He is a gift!